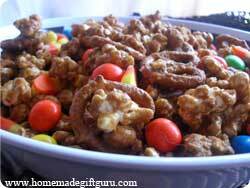 Halloween popcorn is a tasty contribution to any Halloween party. 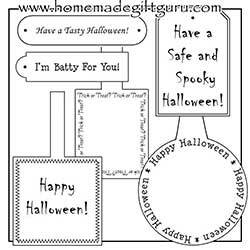 It makes a great homemade Halloween gift and is welcome in most any office or home, especially during the month of October. For a few helpful tips on making perfect caramel popcorn go to our Original Caramel Popcorn Recipe. 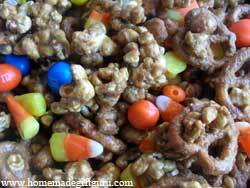 The following caramel popcorn recipe is balanced with both sweet and salty plus it's full of candy corn studded Halloween color. 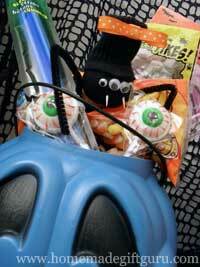 When it comes to decorating and packaging Halloween gifts, your local dollar store is a great place to get a bag of plastic bugs, some creepy halloween candy, maybe even a festive bowl and some halloween ribbon. You could put this Halloween popcorn in a unique Halloween treat bag (this would be to eat right away, not to store). 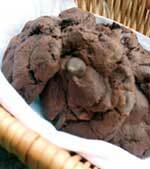 You may also like my chocolate chocolate cookie recipe in a jar! ...they make perfect homemade Halloween treats. 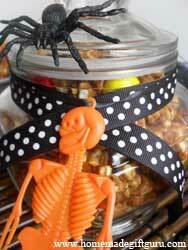 Make the mix as instructed and then decorate the jar in Halloween decor. Give a Laugh with a Sock Spider!